Vitters Shipyard in the Netherlands has signed a new order for a 50-metre classic performance ketch. Commissioned by an experienced owner primarily for cruising, the yacht will be built to Lloyd’s special service craft rules. Construction will start by the end of October and delivery is scheduled for late 2019. The naval architecture for this exciting custom superyacht is done by Hoek Design and Rhoades Young Design is responsible for the interior styling. MCM, represented by Nigel Ingram, is serving as the owner’s representative. 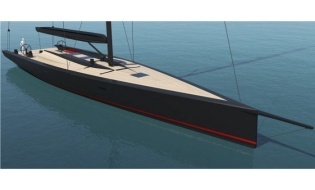 The yacht will have an aluminium hull, built in Alustar, with a centreboard keel and a carbon rig with in-boom furling. The naval architecture has been further developed and fine tuned with the experience of previous projects. The twin deckhouse configuration includes an owner’s deckhouse aft and a central deckhouse complete with saloon. Also on deck will be three cockpits – one for the owner aft, the main cockpit amidships and a crew cockpit forward of the mast. A large tender will be stored on a recessed tender-well on the foredeck. Below decks this 50-metre ketch will have a contemporary traditional interior. The owner’s suite will be situated aft to dovetail with the private deckhouse and cockpit. There will be two dedicated guest cabins – one double and one twin – plus the option to convert a seating area into a third guest accommodation. Other interior facilities include a second saloon and a dedicated gym.The yacht has four crew cabins along with a mess and a separate lounge area.